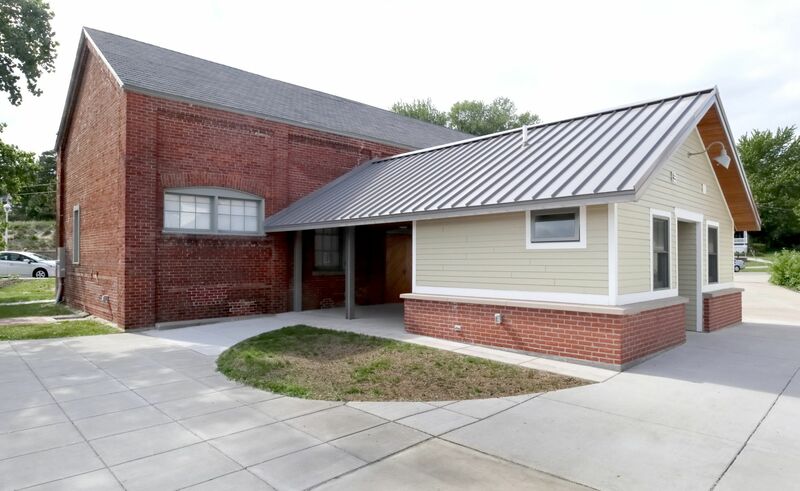 THE PUMP HOUSE MUSEUM AND LEARNING CENTER OPENS FOR THE SEASON ON JUNE 1, 2019. The Historic Ottawa Beach Society is pledged to achieve our goals of preserving area history, presenting educational programs , promoting good stewardship practices, challenging the imagination, networking with other institutions, and enriching the Ottawa Beach and West Michigan experience for residents and visitors alike. 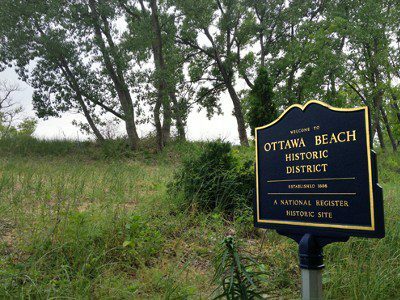 In 1987, a group of concerned Ottawa Beach residents were encouraged and mentored by Willard Wichers to form the Ottawa Beach Historic Committee to collect, record, and preserve the history of our area. 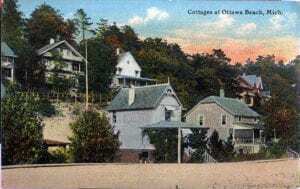 Ottawa Beach is an premier example of the summer cottage resorts that developed along the Lake Michigan shore during the late nineteenth century. In 1885, the West Lake Michigan Park Association was organized to purchase eighty acres of land in Holland, Michigan, located between the north shore of Black Lake (now Lake Macatawa) and Lake Michigan. In May 1886, Ottawa County Surveyor Albert Peck platted the resort with 150 cottage lots, streets, and a lot for a hotel. He designated the majority of the land as park area owned in common by cottagers, with each residential lots abutting one of the parks. The Hotel Ottawa, built immediately by the Chicago and West Michigan Railroad (later the Pere Marquette Railway), was one of the largest resort hotels on the eastern shore of Lake Michigan. Some guests arrived by train, many more by steamship from Chicago. The hotel burned in 1923, but the vast majority of the cottages in the neighborhood have survived intact. The Historic Ottawa Beach Committee achieved Ottawa Beach’s designation as a National Register Historic Site in 1995 and a Michigan Historical Site in 2002. Ottawa County Parks and Recreation named the area Historic Ottawa Beach Parks in 2009. In 2010, the committee incorporated as a 501c3 non-profit, renamed Historic Ottawa Beach Society, to foster cultural and environmental stewardship of Michigan’s historic Ottawa Beach and environs by preserving and interpreting its wonders, memories, and stories. The new “Big Red Exhibit” is open to the public. See our exhibit designer discuss opening day and read The Sentinel’s story about the exhibit: http://www.hollandsentinel.com/news/20180602/after-renovations-pumphouse-to-re-open-with-big-red-exhibit.